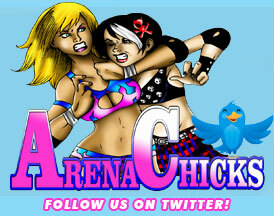 ArenaChicks.com » Blog Archive » Thank You Philly Fans! ArenaChicks would like to thank everyone that turned out for the K&S Wrestlefest “Super Saturday” event held on Saturday, April 9th! We were overwhelmed with the response from fans plus we got to see a lot of super friends in the wrestling community. Special thanks to Ken at K&S for running such a class act convention and we look forward to coming back to the next one! Be sure to check out our next live appearance at the Cape Fear Tatoo & Arts Expo in Wilmington, NC. We will have live matches plus the ArenaChicks will be available for autographs and photo ops plus NEW merchandise that we will be debuting at this event!!! Check out this awesome video by Completely Damaged TV covering the K&S Wrestlefest “Super Saturday” event featuring the ArenaChicks!